It took a biopsy, a week of doctor’s office visits and a dozen or so selfies texted to various specialists to figure out why I was feverish with my arms, neck and torso covered with mysterious red splotches after my recent return from Cuba. I suppose the cause should have been obvious. 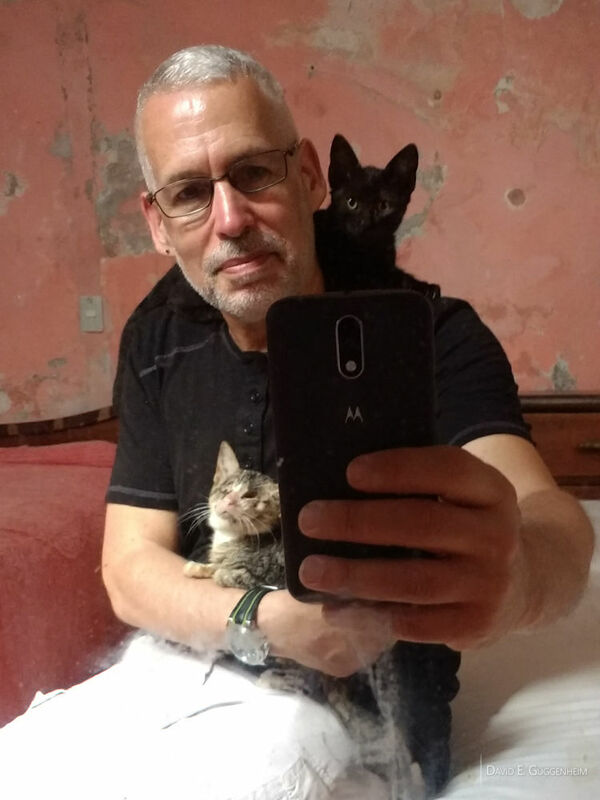 On this trip I spent little time with my usual clients, like fish and sea turtles, and found myself instead around dozens of abandoned dogs and cats, like Tao and Quasi, pictured to the right. Tao likes to lie on your shoulders and wrap himself around your neck. Quasi is affectionate, curious and follows me everywhere. He’s also blind, but gets around remarkably well. The rescuers of these beautiful animals didn’t have the resources to fully treat them for disease, so I ended up catching a classic case of ringworm, a nasty fungal infection for which I’m now being treated. I wear long sleeves as a courtesy to my fellow humans as not to alarm anyone with the pronounced red spots that adorn my forearms. Cuba has a big problem with abandoned and stray dogs and cats, worsened by the fact that there are no subsidized spay and neutering programs. Taking your dog or cat to a veterinarian is expensive for a Cuban, and surgery to have an animal neutered can set you back nearly a month’s salary. I was surprised to learn from my Cuban colleagues that there is no governmental program or agency to deal with stray and abandoned animals, nor are there Cuban organizations like the Humane Society to deal with it. 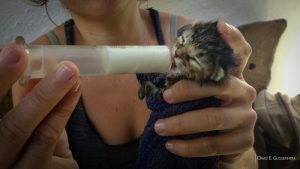 Consequently, it’s not uncommon to find a litter of helpless kittens or puppies left in a park or dumpster. 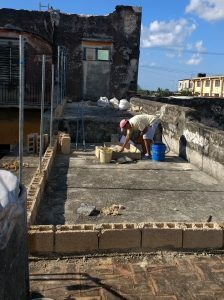 Fortunately, there is a small group of Cuban veterinarians and private citizens who come together, doing their level best to address this problem. Without the resources for even some of the most basic equipment, like surgical gloves, medicines and suture, it’s impressive what they’ve been able to do. These dedicated individuals work to rehabilitate and treat these animals, neuter them, find homes for them and educate the public. Little by little, neighborhood by neighborhood, their efforts are educating and inspiring others to chip in. 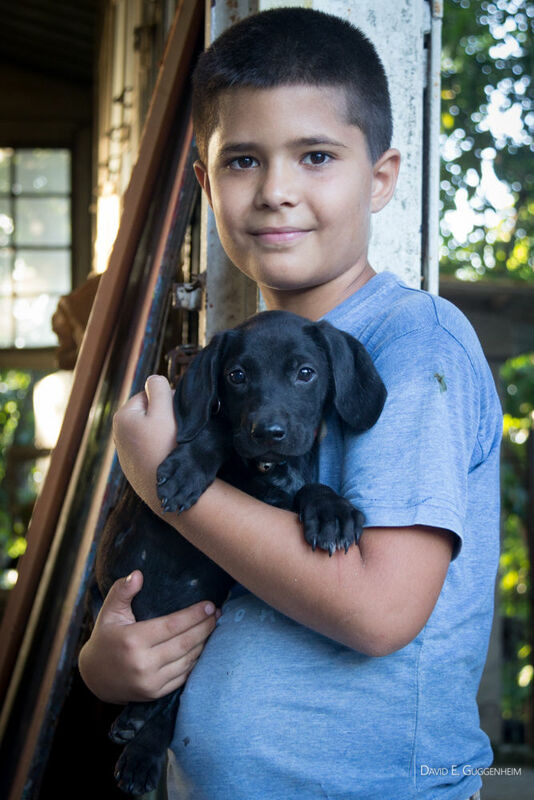 Maylin, who lives on the outskirts of Havana, is one of those special veterinarians who returns home after a long, exhausting day at the clinic to a back yard full of abandoned dogs that she has taken in and cares for. Fortunately, her two sons, who aspire to be veterinarians themselves, help her with the formidable task of feeding, cleaning and loving these animals. 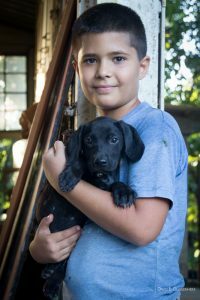 (Right: One of Maylin’s sons cares for an abandoned puppy.) Togther with her sons and her husband, also a veterinarian, they have rescued countless animals. In the past Maylin also cared for dozens of cats but recently learned that one of her sons is highly allergic. It was a difficult decision, but they had to find a new home for the cats. They asked one of their volunteers and colleagues, Lis, if she would take them into her home. That’s where I found Tao and Quasi, along with thirty of their feline friends. Lis had little time to prepare to take in the cats. They have taken over all but the small bedroom of her home. Even there, a few manage to sneak in through the window. Sawdust donated by a local carpenter serves as kitty litter, but many of the cats do their business wherever they please and Lis has to clean constantly, a process that takes hours. It’s a temporary solution, but it’s taking a toll. Lis is unemployed and caring for her mother who has recently become gravely ill. She hasn’t had the time to pursue full-time work — which she desperately needs — because of the hours of work to care for the animals. Most of us would consider her home uninhabitable — it’s a public health risk and I’m a living example of that. Fortunately there’s a solution underway. 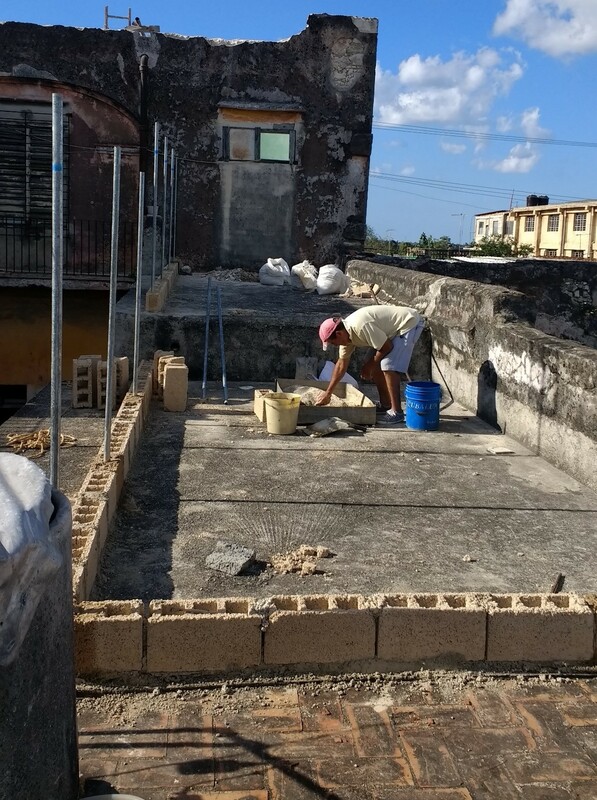 With a small donation of a few hundred dollars, Lis was able to start construction of a roof-top caged enclosure for the cats she’s caring for. 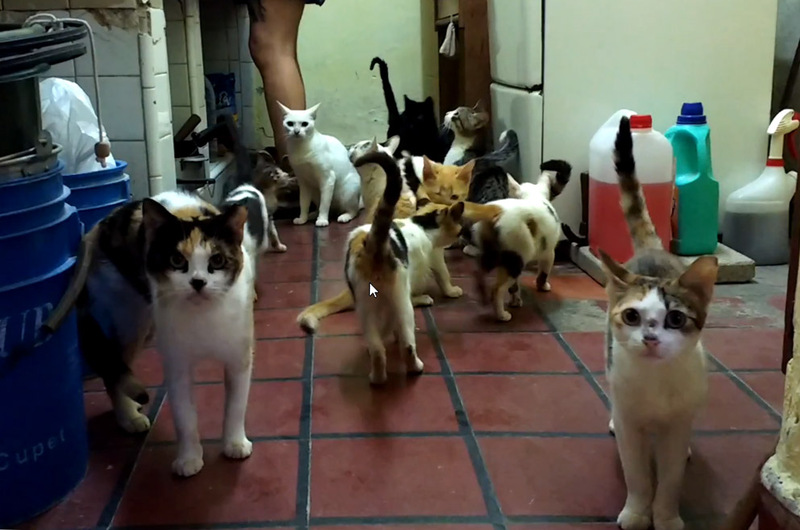 It’s a larger, more open space for the cats and will be far more sanitary and easy to clean. It will also include shelter from the sun, rain and cold. Once completed, she will be able to enlist the help of volunteers to help her care for these animals. Lis has raised half the funds she needs but still needs to raise another $1,000 to complete the project. 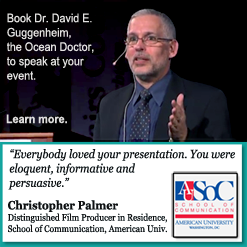 Cats and dogs aren’t included in Ocean Doctor’s mission statement. But today — Earth Day 2018 — it’s important to reflect on what, in general, makes conservation successful. A wise person once told me that it’s not just about saving the whales or the redwoods. At its essence, conservation is about helping people solve problems in their communities. 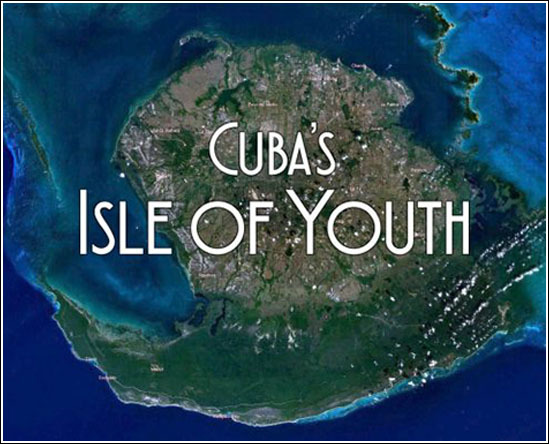 Our work in the community of Cocodrilo on Cuba’s Isle of Youth precisely embodies that. We can’t possibly hope to help that community protect coral reefs unless we help them find economically- and environmentally-sustainable alternatives to fishing. 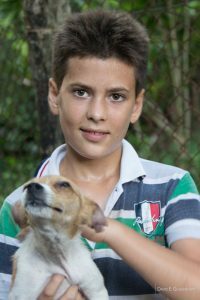 The Cuban volunteers that have banded together to help address the cause of abandoned and stray animals need your help. They have no official organization. Informally, they sometimes call themselves, “Projecto De La Calle” (Project “From the Street”). But in the end, they are simply people coming together to help animals. So on this Earth Day we ask you to consider helping us help the hard-working volunteers of “De La Calle” solve a vexing problem in their community, and help people like Maylin and her family, along with Lis and others, rescue, rehabilitate and find homes for these animals while working on ways to eliminate the problem altogether. Your donation to Ocean Doctor will help their efforts. We’ve come to know many of these wonderful individuals because they’ve been there for us over the years helping our marine conservation efforts. Earth Day is a time to recognize that conservation is not a task left solely to governments and large environmental organizations. 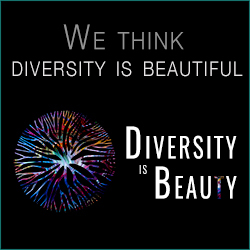 It’s about individuals and each of us joining together to solve problems in our own communities. That is truly the best hope for our planet and the beautiful animals — be they slimy or fuzzy — that inhabit it. 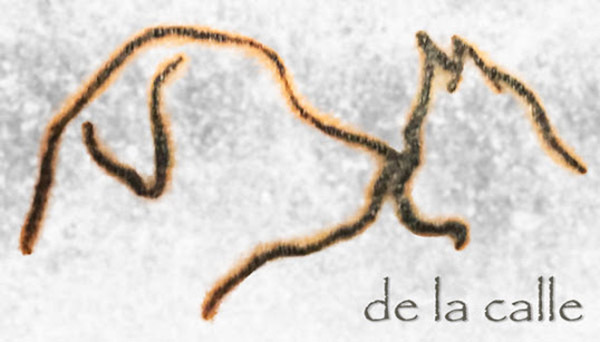 Project “De La Calle” (From the Street) is the effort of Cuban volunteers, including veterinarians, to help address the serious problem of stray and abandoned cats and dogs in Cuba. The group works to rescue, rehabilitate and find homes for the animals. They are also providng spay/neutering services and working to educate and engage the public. Ocean Doctor applauds their efforts and to celebrate Earth Day 2018 is accepting donations on their behalf.